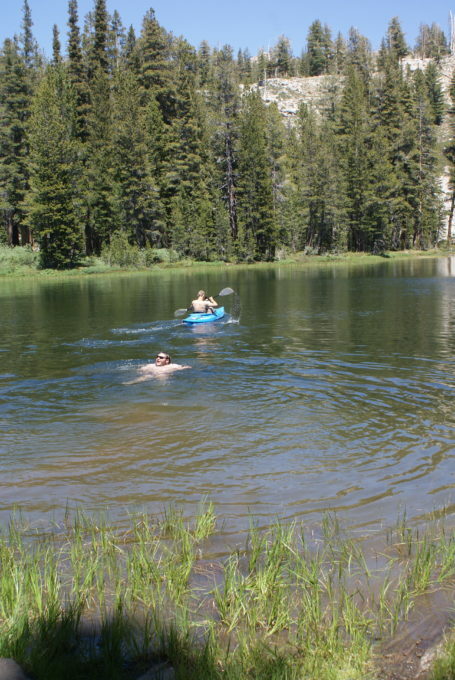 One of the crown jewel trails in the Sierra National Forest Ranger District, Swamp Lake is a treasure of a trail. Swamp Lake trail is 13 miles long and will test the driver and vehicle. This trail is not as long as Dusy Ershim Trail, though it will give you the same type of terrain and obstacles. Dusy has Chicken Rock, and Swamp Lake has Rooster Rock. Both will get your attention and require concentration while negotiating the climb. “Swamp,” as we call it, has obstacles with the following names: Blast Rock, Pinch Point, and Sharks Tooth. I am sure everyone has specific names for some of the smaller obstacles and there are plenty of them along the trail. 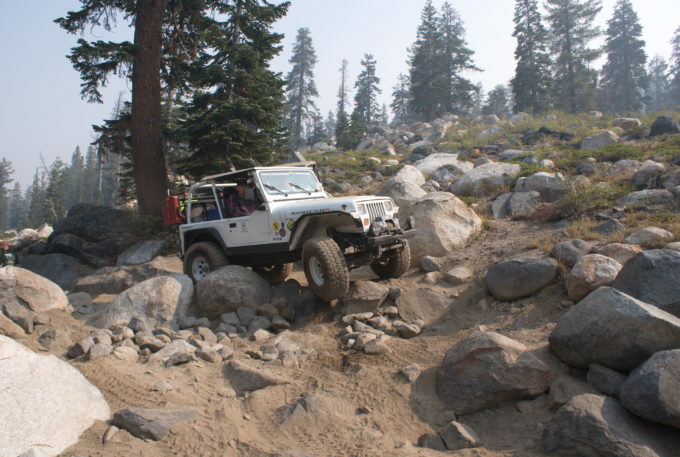 There is enough rock crawling that you will have very little time to relax behind the wheel of your rig. This trail can be run in either direction. I personally think if you are going South to North, the trail is a little harder. This is because you are going up Rooster Rock and going up through Pinch Point. Gravity is your friend going North to South. On the South end, there is a long down hill section with football-sized rocks that will make you wish for the trail to end soon. This section just seems as though it never stops and then you are in the trees at the bottom of the mountain and it is all good as you look upon the beauty of the mountain. There are many places to pull over and take lots of photos with views stretching for miles and miles. With 24 miles of trail while ascending nearly 5000 feet, pics are just plain necessary! We usually take lunch to stop at either Swamp Lake itself of Grouse Lake. Grouse Lake is an easier stop as it is right next to the main trail. If you want to get close to Swamp Lake, you will have to walk down to the lake. Depending on the time of year, take some good bug repellent if you plan to stay at the lakes for very long. The last few years I have ran the trail in one day, and it will leave you beat up at the end of the day. I have camped at Swamp Lake before and really prefer to do that, as it breaks up the trip into manageable sections and gives you a rest half way through the trail. If you camp at Swamp Lake you will want to take your fishing pole as the fish are usually hungry and will jump on your hook. Grouse Lake also has some great fishing. 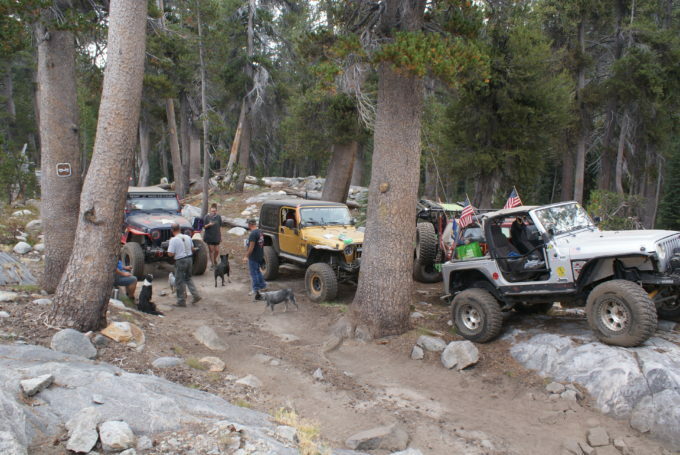 The Four Wheel Drive Club of Fresno has installed pit toilets at both lakes, and they maintain the trail with help from the local clubs in the area. 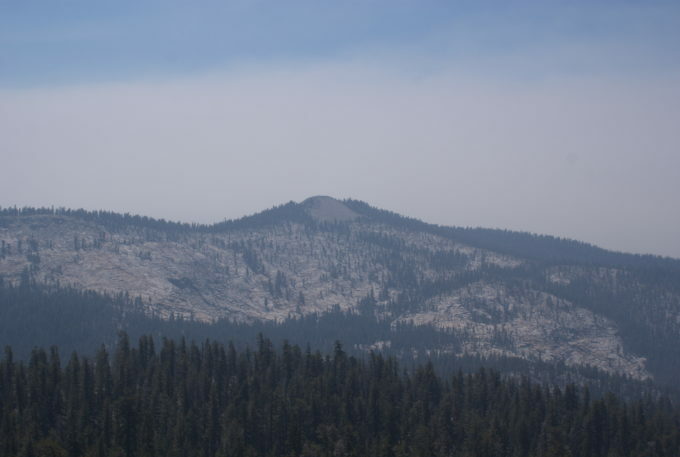 July 4th is the typical opening date and can depend on the amount of snow that the mountains have had. I have seen snow still on the trail in July. If you go late in the year to run the trail, you will want to plan for some possible bad weather. 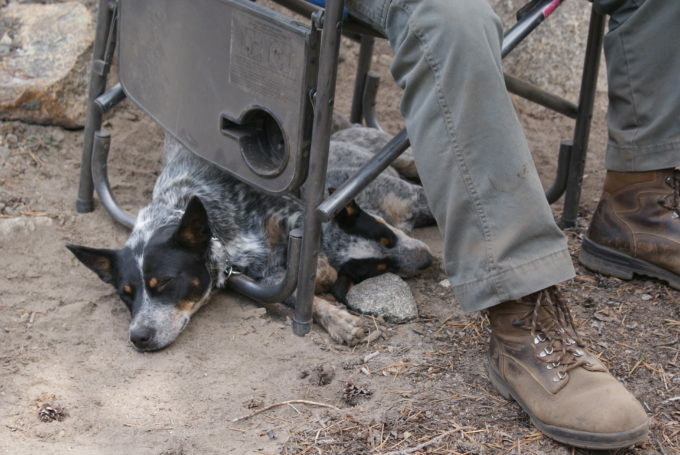 I have seen rain during the summer on the trail, and it changes the whole complexity of the obstacles. I have talked to people who have had snow in late August while on the trail. That will make for a very tough trail ride with snow and will make it very tough to find the trail in some places. Take the time to find this trail and check it off your bucket list. You will not be sorry that you did this trail. 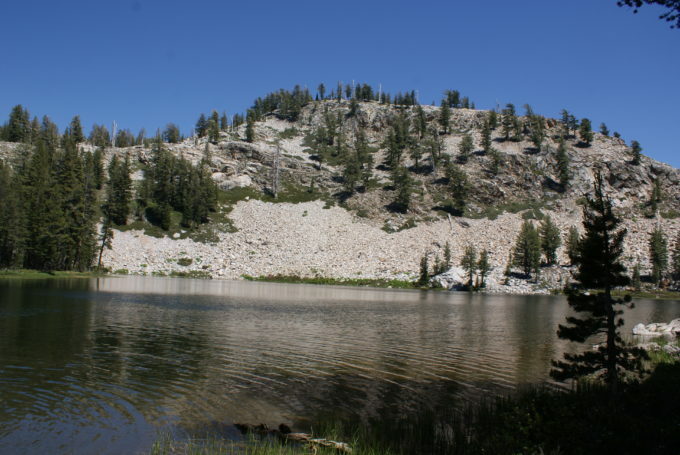 Located near Lakeshore, CA, not far from Fresno, CA, Swamp Lake Trail is a high elevation trail reaching over 9000 elevation at one point in the Sierra National Forest. 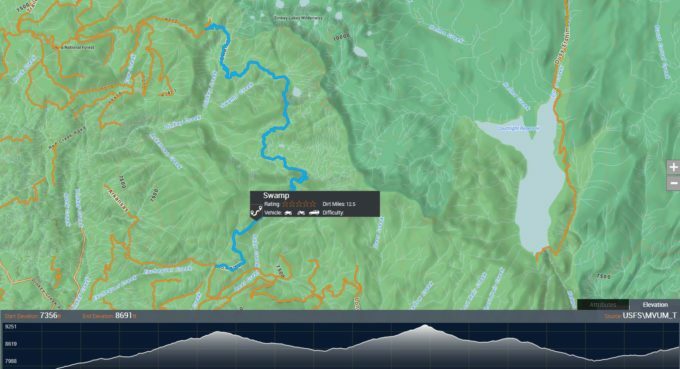 Very nice writeup and the trails look great. What level of trail would you say these are? From the looks of some of the 4×4 units, most appear to be for almost rock crawling level of vehicle. Would a slightly modified Jeep make it or do you need a rig highly modified? The scenery looks great and the lake picture at the end is absolutely fabulous! If we use a rating of 10 for the toughest trail to 1 being a county road, I would have to rate this trail as a 7. Only a couple of the obstacles are at that rating. The pinch point at the top of Rooster rock is pretty tough and narrow. The obstacles do not have by-passes. Some of the boulder fields have easier lines and this changes every year. I would say a 35″ tire is minimum, a locking differential is mandatory and two is better. A winch is mandatory along with the other recovery equipment. 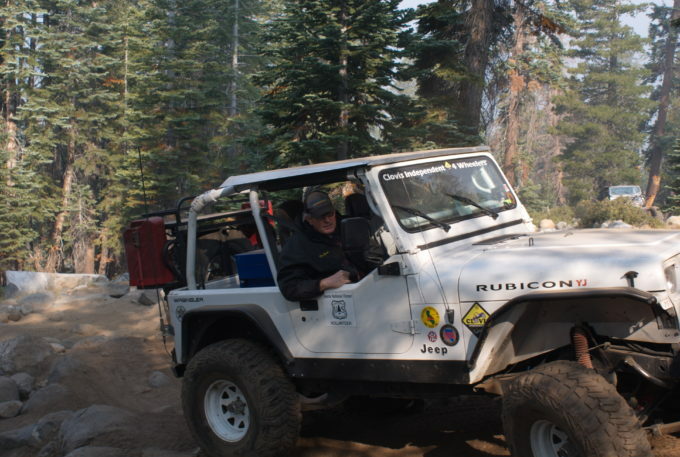 Cal4Wheel has an event that they take people across this trail with an experienced trail leader and a sweep crew that can fix just about anything. If you have never done a trail like this, I would go that option for my first trip across the trail. Thanks for reading this article and the feedback. Thanks for responding. My local club (Las Cruces Four Wheel Drive Club) sponsors the New Mexico Chile Challenge each year in October, usually after Columbus Day. We’ve adopted the trail ratings used by MOAB, so we are more consistent for other users here in the West. Your article made me start thinking about how difficult some trails are for some, but those with the right equipment usually have a different kind of challenge. 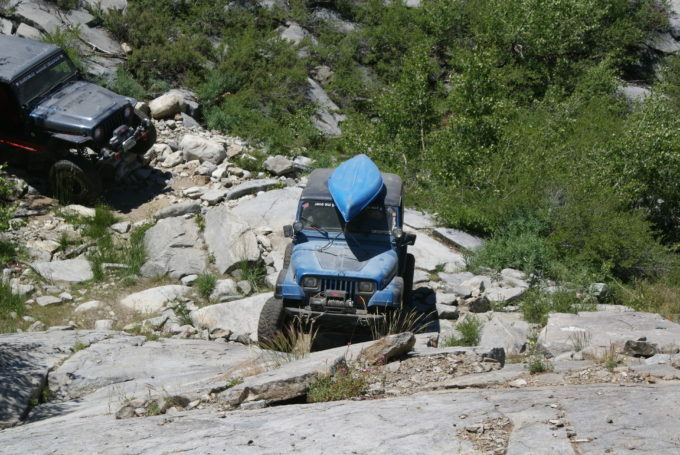 For me, the challenge is learning what I can about the trail & getting used to driving the Jeep (JKUR) in the terrain. My Jeep has a 3″ lift & 35″ tires along with very good skid plates as well as steel bumpers and a winch. Learning to drive off road in a 4×4 has become a great deal of enjoyment for me since I retired some years back. I fully enjoy reading the various articles on your site and am learning to become a better driver as a result. I live in West Texas now, and the Chile Challenge is not that far away. I will have to try and make it this year. If you ever want to run Swamp or Ducy, let me know, as I know a few guys with rigs that can do both and I am sure they would love to show you through the trail.